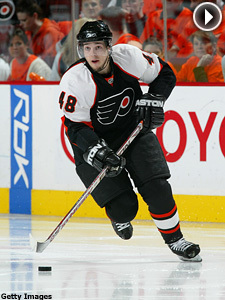 Danny Briere's season was filled with both ups and downs, however he still managed to finish with 31 goals and 72 points. The Philadelphia Flyers' collapse proved to be just a one-year blip. The Flyers hit bottom in 2006-07, plummeting from 101 points to a League-worst 56 and failing to finish in the top two in the Atlantic Division for the first time since 1993-94. Happily for the Flyers and their fans, the Flyers bounced right back into the Stanley Cup Playoffs, finishing sixth in the East with 95 points after a series of smart moves by GM Paul Holmgren filled a number of holes. The Flyers then upended Washington and upset Eastern Conference regular-season winner Montreal before coming up short in the Eastern Finals against Pittsburgh. The Flyers became the first team in NHL history to go from finishing last overall to a plus-.500 and the conference finals in the following season. They also rediscovered their niche as one of the NHL's most physical teams, playing with a swagger that hadn't been seen in the City of Brotherly Love for years. "For us to come out of last year where we were getting killed every game, this has been a tremendous response as a group," forward Mike Knuble said following the series-ending 6-0 loss to Pittsburgh. "We knew we could rebound, but to find ourselves in the conference final — I think that caught a few people off-guard." Even better is the fact that most of the Flyers' key players are young and have room for improvement. Martin Biron, acquired by Holmgren at the trading deadline in 2007, gave the Flyers solid work in goal, posting a 30-20-9 record, a 2.59 goals-against average and five shutouts. He took his game to another level during his first trip to the playoffs, outplaying his rivals in the Flyers' victories against Washington and Montreal before the loss to the Penguins. Kimmo Timonen, one of Holmgren's key offseason acquisitions last summer, largely justified the long-term deal he received after coming over from Nashville. His eight goals and 44 points don't tell the full story of what he meant to a defensive corps that had fallen apart the previous season. His absence against Pittsburgh was felt. Veterans Jason Smith and Derian Hatcher may not be back, but the Flyers have high hopes for Ryan Parent, who came from Nashville in 2007. The Flyers had a balanced attack in 2007-08, and should be even better if Simon Gagne can overcome the concussion symptoms that cost him two-thirds of his season. Gagne had 47 and 41 goals in his previous two seasons, and his absence was a loss. Gagne expects to be healthy for training camp. If he can return to form, the Flyers' core group will be even stronger. Mike Richards, Danny Briere and Jeff Carter give the Flyers a solid nucleus. Richards (28 goals, 75 points in 73 games) is an emerging star and could be the team's next captain if Smith doesn't return. Briere, the Flyers' big free-agent signing last summer, had his ups and downs but still finished with 31 goals and 72 points, then went 9-7-16 in 17 playoff games. Get your RBK Flyers Home Jersey Now! Carter (29 goals) is a restricted free agent who may draw interest. Scott Hartnell (24 goals) and Scottie Upshall (14) gave the Flyers plenty of grit up front while contributing offensively — though more will be expected of them in 2008-09. The same is true of Joffrey Lupul, who had 20 goals in 56 games and, at age 25 when the season starts, will be counted on for more offense. There's more help on the way, too. Forward Steve Downie showed that when he plays with discipline, he's capable of being an NHL player. There are high hopes for youngsters like Claude Giroux, who had 51 points in 19 playoff games in the Quebec League, and James van Riemsdyk, selected No. 2 overall and coming off a solid first season at the University of New Hampshire. He's elected to stay in college for at least another year, but is expected to be a major contributor in the near future. Richards, who signed a 12-year contract that will make him a Flyer for a long time to come, expects Philadelphia to be among the NHL's elite well into the future. "I don’t think too many people gave us much of a (chance) this year, and with some of the things we did, it makes you that much more excited for next year," he said, looking ahead to 2008-09 after the loss to the Penguins. "With the players that we have here and how young we are, and really a good, hard-working team, you can’t help but be excited for the future."